noted: Hair today... gone tomorrow! 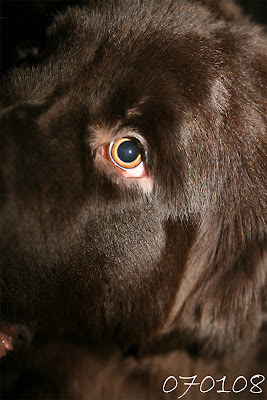 Dark days = flash = dog catchlights! Martha is currently going through a rather fun process, which can only fully be appreciated by other Newfie owners (i'm sure Kat will agree with me!) Its known as blowing coat. Now this isn't a simple moulting process, it's a little bit more dramatic! On Saturday bits of Martha's coat started to come out in little clumps, the next day it seems like her entire huge fluffy puppy coat has erupted to the surface and with just a bit of encouragement explodes over every surface! So i've spent the last 2 evenings combing out literally armfuls of coat... i think i've got her hair trapped everywhere, in my eyeballs, and up my nose, thank goodness I'm not allergic and thank god for Dysons! The coat left behind is definitely not huge at the moment, but it's a gorgeous chocolaty brown - beautiful, but thankfully she's got a couple of months to grow a bit more before Crufts! Now i'm sure owners of other breeds reading this will be saying.... 'ah yes, my dog moults, she's making such a fuss, how bad can it be?' Well put it this way, the pile of hair has been at least equal to the size of a Newfie each evening! Gotta love em! I'm still extracting it from my home after M's visit on Sunday, so I can testify to katy's plight!